If you've created or found something you think we should feature in a future edition of Web Animation Watch then drop us a line today. We'll be back soon. 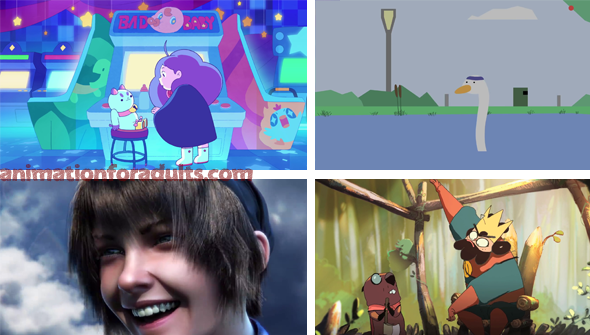 The first four episodes of Natasha Allegri's wonderful, oddball series Bee and Puppycat were available on YouTube, For some time though, the subsequent episodes were only available via Cartoon Hangover Select on the US-only VRV streaming platform (or original Kickstarter backers). Now, CH are releasing the remaining episodes of the first season for viewers worldwide via their YouTube channel, one every week. And boy is it ever good to have them back! We know we're not the only ones who are excited for the release of Untitled Goose Game, the upcoming video game from developers House House. We're also not the only ones to notice that the game's premise makes it a strange cousin of the classic Metal Gear Solid series. This piece from Mashed and RageNineteen, mashes the two together, with entertaining consequences. The animation does a spot-on job of recreating the Goose game's lovely visual style. This beautifully made short features a girl taking "her uncle for a walk". To say any more would spoil the surprise, but suffice to say, there's a twist in this tale. The most intriguing thing about this film though, is that it introduces the world of an upcoming feature film Stina And The Wolf, currently in production. Another absolute gem from this year's crop of student films from the prestigious Paris Gobelins School. This short features a wandering King (or perhaps wannabe-King) who encounters a Beaver in the woods and enlists them to build a castle. The film has an irresistible style which combines beautiful backgrounds with a manic cartoony character animation style. And what an ending! A new Gobelins short will be released every Thursday until December. If you're into webcomics at all, the chances are you will have come across Sarah's Scribbles, the phenomenally popular semi-autobiographical comics from Sarah Anderson. But did you know they had been animated? GoComicsTV released these animated versions of several of her most popular comics, animated by Valerie Paykov. See all episodes here. A surfer is abducted by aliens and made to compete in an extra-terrestrial arena in this excellent short from Australian filmmaker Hayden Morris. It combines a colourful Thor Ragnorok style sci-fi setting, contrasted with the more down-to-Earth story of the girl the surfer left behind, to create something much deeper than it first appears to be.